Portable and soft-sided, our Warm ‘n Go Wipes Warmer is a must have for a pleasant baby changing experience. Warm up to 30 wipes by simply plugging the charger into the vehicle. Wipes are warmed from the top down and the case features an easy-flip lid to quickly access wipes. 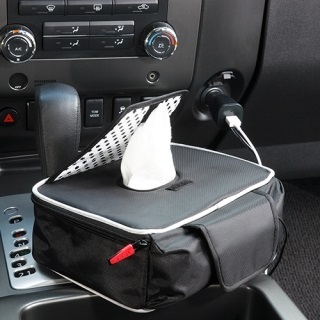 Warm ‘n Go Wipes Warmer has been innovatively and safely designed to automatically shut off once it reaches 70° F.
A USB connection is also included on the DC to charge your phone. The sleek and modern design consists of a storage pocket for the charger plus a carry handle for easy transportation.